Our Bua-Nua section will teach your child the skills of Gaelic games (Hurling ,Camogie and/or Football) in a fun and safe environment where full participation is actively encouraged by our parent volunteers supported by our professionally qualified GPO Sean Cleary. Typically a child will spend two years in Bua-Nua after which they will move to our Under 8 “go-games” teams – children remain at under 8 until they are old enough to move to Under 9. Club Hall (Winter Tuesdays or if pitches are called off.). If you are unsure as to the location of a particular training session, simply ring the An Bua-Nua Voicemail on 087 51184647 and listen to the recorded message. As the weather can be changeable, please re-check the voicemail again at 9am on Saturday mornings and 6pm Tuesday evenings – venue will not be changed after this time. Q : If the weather is bad , how will I know if training has moved indoors ? A: Ring the Bua-Nua Voicemail - 087 51184647 Cut-off for changing message is 9am on Sat morning and 6.00pm on Tuesday evenings. After these times the venue will not be changed. Q: What age is the Bua-Nua intended for ? A: Boys and Girls age 4 to 6. From age 7 or once 2 years are completed in Bua-Nua, children play at under 8 level. Q: How is the training structured? A: The 90 minute session includes a 5 minute kick/púc about, 15 minute fun game to warm up , 3 x 10 minute stations focusing on a particular skill e.g. Kicking/ hand passing/ hurling lineball , running. Followed by a 30 minute match. Q: Do children in Bua-Nua get to play against other teams. A: Yes–towards the end of your child’s second year we organise challenge matches against other clubs. Q: What is the club ethos? A: The emphasis is on participation and enjoyment – learning through fun. All players, no matter what their skill level, get to play and everyone is substituted. Our approach is to build confidence through encouragement and to make the game as enjoyable as possible, following approved GAA coaching methods. Q: What does the club expect from parents of Bua-Nua children? A: For children in the Bua-Nua, the club expects that a parent/adult responsible for the child remains at the pitch at all times. One adult can be responsible for more than one child at a time. Parents should bring a drink to all sessions and in cold weather hats, gloves , warm top etc..
Q: When do you stop for Winter, Summer holidays etc.. ? A: In general we follow the school calendar – you will be notified throughout the year and on the Bua-Nua voicemail. Q: What are go-games ? A: Special small sided games designed by the GAA for younger children with rules and equipment appropriate to the age group in question. Various types of go-games are played from Bua-Nua up to age 12 in both hurling and football. Q: Is there any girl-only sides ? A: Yes – we offer Camogie and Girls football from age 9. Up until then all teams are mixed. Q: What does it cost for my child to participate in the Bua-Nua ? A: There is a €3 weekly charge for the Bua-Nua. This covers both Football & Hurling. All money generated from this fee goes back into improving the Bua-Nua facilities for your child. Q: What should my child wear for hurling ? A: For hurling children MUST wear a helmet - Helmets are supplied to new players for the first 6 weeks, after which they are expected to purchase their own helmet. (available in club shop) We also encourage children to wear shin guards. Q: What size hurl should I get ? A: Hurls should be ground to hip height (not waist!) - for most Bua-Nua players this should be 26” to 28”- again available in the club shop. Q: How does the under 8 league work with both codes (i.e. football and hurling) ? A: Matches take place Saturday morning alternating between home and away matches. One Saturday we play hurling, the next is Football and so on throughout the year. Q: When is the club shop open and what does it sell? 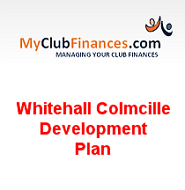 A: WCC gear can be purchased online at https://www.thegaastore.com/SearchResults.aspx?Search=whitehall+colmcille. It sells everything from club jerseys/tracksuits, hurls and helmets to beanie hats and caps. Q: Do you organise camps and mini-leagues? A: Yes , we have Easter camps & Summer camps together with min-leagues (usually last 2 weeks in June) and blitz/skills competetions throughout the year. Mentors will communicate details in advance. Q: Can parents help/become involved ? A: Yes – parents are encouraged to become involved – formal GAA coaching courses are offered to all mentors throughout the year. If you are interested in mentoring, please make yourself know to one of our mentors. If you are not interested in mentoring you can help in other ways - we need parents to help us gather up and store equipment, administration tasks etc. 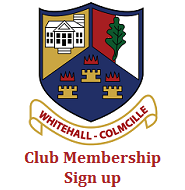 The club is run almost entirely by volunteers and new help is always welcome. Q: Is anything organised for the parents ? A: Yes, a number of times a year we have social nights/supper dances in the club. Bingo is also on every Wednesday together with the Club Bar which is available to all( members. And non-members).